I shared with you last week that we’re permanently done with babies so this week has been another emotional one and hit me harder than I expected. Loki, my youngest is 3 in January and will hopefully start Nursery at the same school his brothers attend. There are no baby and toddler groups in our local village for us to go to anymore so I’ve been keen to get him some social interactions with kids his own age. Chatting it through with the husband we decided to look for somewhere to send him privately ahead of starting nursery. When the boys went back to school a few weeks ago I looked at a local private nursery after I heard they offered play sessions. Loki still naps in the afternoon and all day sessions weren’t something I was interested in but unstructured play sessions sounded ideal. I went to have a look on Monday and was really impressed with the set up. All child led, loose parts everywhere, wee play scenes and small worlds set up, creative stations, a good outdoor area with lots of opportunities for free play. It was great so I signed him up there and then. He started the very next day. I didn’t cope very well! It sounds ridiculous but it happened so fast and I didn’t really think about it or realise the significance of it until I got home to my empty house. Another last “first” over just like that. His first play session. His first time away from me with strangers. Bizarrely the first time I’ve ever been alone during the day at home. The wee rascal didn’t even care! I left him painting quite happily and he just casually said “bye bye” – it was brutal! In all honesty, I was delighted. Edward had terrible separation issues whenever I left him and I was afraid Loki would be the same. Oren, was always happy to go in and I just couldn’t call how Loki would react. When I did manage to claw Edward off my leg and leave him he was usually in tears and I felt awful so it was lovely to see Loki so happy and settled. I’m genuinely pleased how totally unphased he was. I picked him up just over 2 hours later and he was sat waiting for me on this tiny chair with his wee bag and coat on and he looked so much older. My not so wee toddler is definitely fast becoming a little boy ready for adventures with his brothers! He was high on life and talked none stop for the next hour. I think I can safely assume he had a blast there and he kept asking to go back. Loki’s firsts are always a touch more emotional for me than the same firsts with his brothers because I know they’re the last. I’m not ashamed to admit that I felt totally lost. Broken even. A whole piece of me was missing. Even if it was just for a few hours. His second session later on in the week was harder as he wasn’t too keen on being left. As I waved goodbye, I saw he had a wee lip wobble. Just for good measure on the walk home so did I! In the end I wasn’t too worried during his second session, as I knew he’d be ok. At noon he was waiting for me eagerly again with his coat and bag. 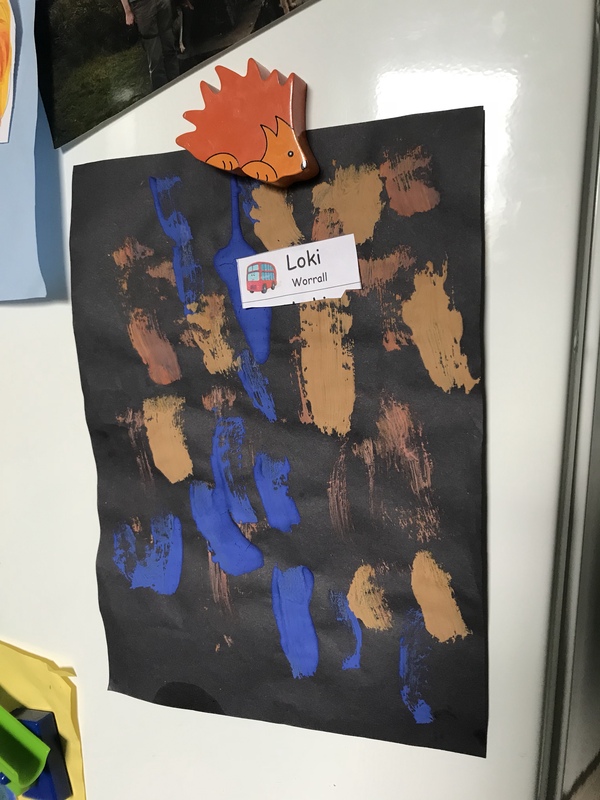 I also got my first painting for the fridge, which he was immensely proud of. He listed all the colours he’d used and even managed to say the word “brown” clearly for the first time. Wee star. So another last first done. Bring on the next one! Do you have any last firsts or similar stories to share – I’d love to hear! Mainly just to reassure me that spending a couple of mornings a week a little lost for the foreseeable is perfectly normal Mummy behaviour! Awww, it’s so hard, no matter how pleased we are for them! We took down the cot for the last time today – it could actually be the last time anyone ever uses that one. I know – I’m on it!